One of the most important inns outside the city wall in the 18th and 19th century was the Barnstaple Inn, by the North Gate. Its position, on the road to Barnstaple made it important for the coaching trade, especially as the approach to the city was the most difficult of the four gates due to the steep approach from the bottom of the Longbrook Valley. 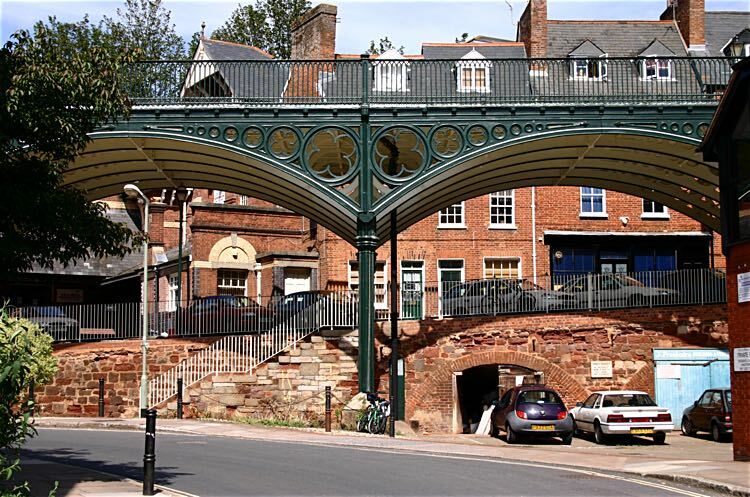 The Exeter Turnpike Trust was established by Act of Parliament in 1753 to establish a network of roads across Devon, radiating from Exeter. One of the routes was from the “bottom of causeway in Parish of St David’s to Crediton.” The bottom of Lower North Street, had been known as ‘The Pit’–hence the building of the causeway across the bottom of the valley. Roque’s map of 1744 shows a building that may be the site of the Barnstaple Inn, although some sources claim it was built in 1769. The Barnstaple to Exeter, six-horse mail coach was introduced in 1769, when the North Gate was removed. The inn did well as the Barnstaple coach would disgorge its passengers at the inn, before continuing up North Street. 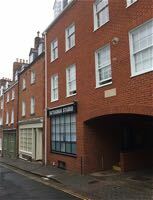 The inn was soon a venue for creditors meetings as evinced in Brice’s Old Exeter Journal in August 1791, with a notice that the inn was hosting a meeting of creditors. 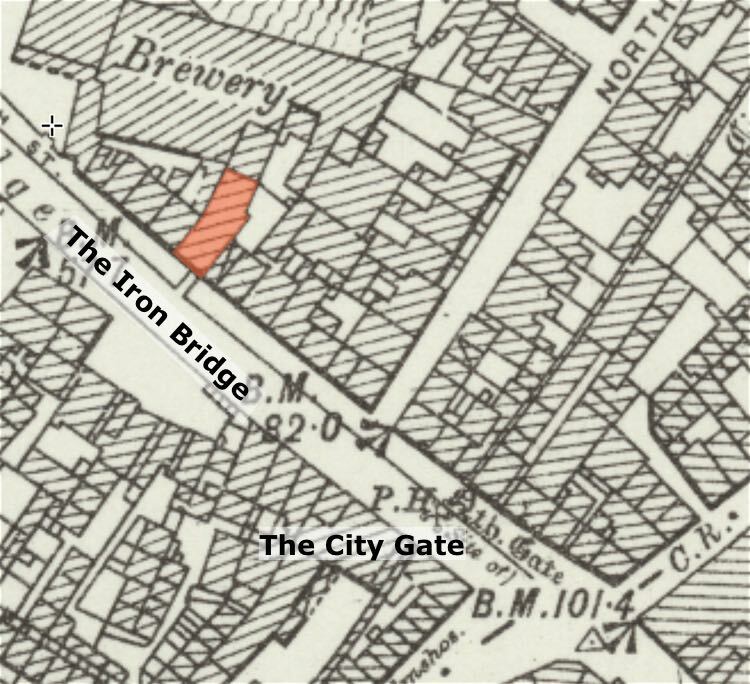 December 1799 was an important time for the inn and the brewing trade in the city when William Harding entered the licensed trade. He and his successors would leave a mark that still exists today. WILLIAM HARDING, most respectfully informs the nobility, gentry, gentlemen travellers, and the public in general, that he has taken and entered upon the above INN, lately occupied by Mrs. Goss, which he has fitted up with new furniture, the best of beds, a large stock of excellent old port and other wines, with every accommodation to render his house comfortable, and hopes by a strict attention to business, to merit their approbation and support. N. B. Good for horses. The danger from illness at the time is highlighted by Harding having had two wives by 1810. His first wife died in June 1805 and his second wife in June 1810. This double setback did not prevent his ambition to succeed, as will be revealed. Harding was a warden, along with Samuel Kingdon, for the parish of St Davids. The Barnstaple Inn thus became the choice of venue for a celebratory dinner for fifty, including the Mayor, on the laying of the foundation stone for the new St David’s Church in June 1816. Harding leased the inn until June 1820 when he purchased it outright. Harding went into partnership with W J Richards, who already owned the malthouse, now known as Casa Italia (formerly Ginos Restaurant) in Bartholomew Street, sometime before 1817. They ran the brewery at the Swan in Cowick Street, while they gradually acquired and let other public houses through the city to add to the Barnstaple Inn. The approach to North Street from Lower North Street was always a problem because of the gradient. In March 1833 the Improvement Commission discussed ways of easing the problem, including an ‘arch across the pit’. 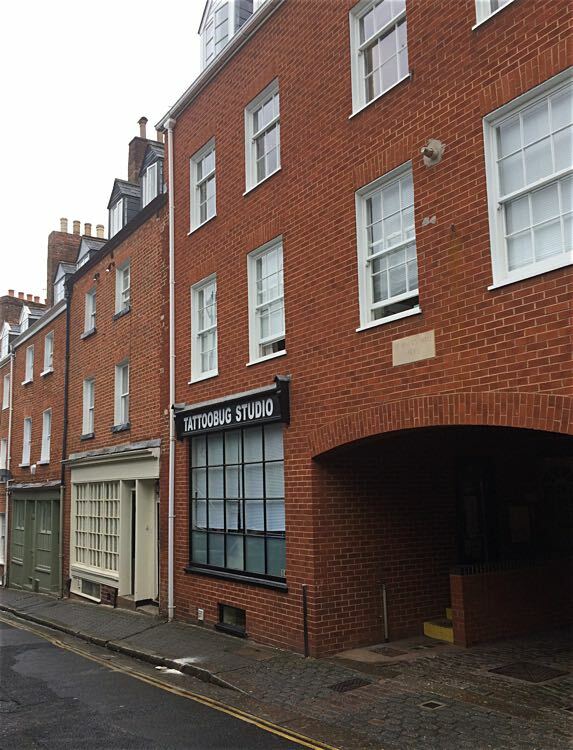 Mr Harding objected to this because it would damage property in Lower North Street. By December the committee were considering an Iron Bridge, and soon after construction of the Iron Bridge commenced in 1834. Harding, who was a member of the commission, declined compensation if any damage was done to his inn, so long as a "good entrance was made to the Barnstaple Inn." 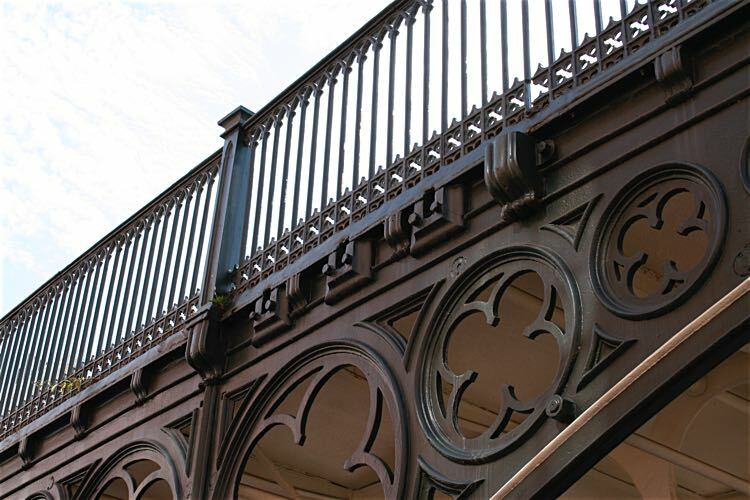 An entrance, via a footbridge, was made from the Iron Bridge, and although no longer there, the fixing points cast into the bridge can still be seen. After the Iron Bridge was constructed, the daily 10.20am arrival via Tiverton, Royal Mail Coach from Barnstaple entered the city over the bridge, and the Crown and Sceptre captured some of the trade that the Barnstaple Inn previously served. The Barnstaple Inn was leased to Mr R F Taylor, while Harding pursued his other interests. The inn was the venue for many property auctions and coroner’s courts, related to St Davids and the local area. After Harding died, and also the death of Taylor, Harding’s widow gave notice in December 1840, for the inn to be let. In March 1878, Harding and Richards along with a new partner Mr Thomas, opened the modern St Anne’s Well brewery in the stable yard at the rear of the Barnstaple Inn. While serving the beer of the brewery at the rear, the Barnstaple Inn no longer had the same importance that it had in the age of the six-horse coach. There was an attempted murder at the Barnstaple Inn on 25 April 1891. William Townsend, a Tiverton bootmaker was charged with the attempted murder of his wife. Six weeks earlier, Townsend was forced to enter the Tiverton workhouse, while his wife and two children travelled to Exeter where she moved in with another man for shelter. On his release from the workhouse, Townsend found his wife and went with her to the Barnstaple Inn, where he attacked her, by cutting her throat with a shoemaker’s knife. An assistant at the inn, Samuel Lock rushed into the room and took the knife from Townsend. Bleeding profusely, the woman fled the pub to Paul Street, where she was found by two policemen and taken to the Devon and Exeter Hospital, while Townsend was arrested. The children were taken to the workhouse. In the first weeks of the First War, troopers of the Royal 1st Devon Yeomanry were billeted at the house–in October 1914 they presented the landlord, Mr Takle ‘a handsome piece of plate’ because of his kindness towards them. The inn must have retained its high reputation with soldiers as the National Union of Ex-Service Men had a meeting at the house in June 1920, where they discussed the problems of disabled and demobilised men with pensions, unemployment and training. The last directory listing for the Barnstaple Inn was in 1967, and soon after it became a DIY store. It was gutted by a fire in 1970, leaving the shell. Most of the buildings in Lower North Street have become housing, with some shops. The brewery to the rear briefly became the Fizgig and a gym, but has since become student flats. 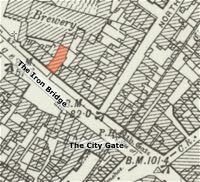 The remains of the inn were demolished and the site rebuilt as apartments and the Tattoobug Studio–the address is 14A, Lower North Street. Sources: turnpikes.org.uk, St David’s by Joyce Greenaway (Civic Society), the British Newspaper Archive (Sherborne Mercury). Map showing the location of the Barnstaple Inn. The City Gate (Crown and Sceptre) is marked to help orientation. The modern apartments and the Tattoobug Studio on the site of the inn. The location of the fixings for the small footbridge to the Barnstaple inn on the Iron Bridge. The raised roadway of the causeway. It was the first attempt to ease the incline from the valley to the North Gate.